Braiders are used to braid the outer sheath on electrical cables. 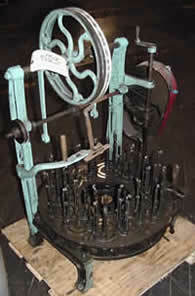 In many respects they are very akin to many textile machines. The core travels into the braider and a series of bobbins plat or braid the sheath around the cable core. The noise climate is characterised by many mechanical interaction noises. The wire reel and drive shaft had covers constructed from a thin metal sheet. The mechanical interactions were putting considerable vibration energy into the cover that then behaved like a loud speaker cone and radiated airborne noise. A 3mm pitch-based damping sheet was fixed to the wire reel and drive shaft covers. As an experiment the braider was placed on a make shift anti-vibration mount to reduce the amount of vibration travelling into the main body of the machine. The application of the damping sheet reduced the noise level by 3dB and the anti-vibration mount produced a further 2dB reduction. A total noise reduction of 5dB. £150 per braider (2005 rates).